Saturn is a planet of ground reality. He shows you a side of people and situations that you don’t want to see because if your personal definitions and conditioning. Saturn creates lessons where even your close family members behave in ways that you cannot imagine. Saturn makes you face circumstances that you never thought you would have to and He will make you do things you never did before. The more you try to run away, the harder the lessons become until you end up with your back to the wall, forced to face reality. If you resist, your intuition and decision making power is disrupted. These emotions block your Ajna chakra and lead to headaches, eye problems, sleep problems and Sinus issues. Know that Saturn’s lessons are all about acceptance. Accept everything bout your current life situation – whether it is about your children, your current job or marriage situation. Release all resistance and accept things as they are. Only then you will find that you are able to change your circumstances. Saturn makes you connect to your higher self which is full of compassion, forgiveness, contentment, intelligence and gratitude. He shows you that every situation has a solution in your domain and you just have to See. How do you forgive people and make peace with situations that you thought unimaginable? Try empathy. Imagine yourself in the shoes of others and try to understand why they behave that way. The reason could stem from their background, their fears, weakness or their perceptions of the situation. It has everything to do with them and nothing to do with you. So release all feelings of hurt and forgive from your heart. Ultimately everything is happening so that you realise your own divinity. During Saturn transits, your ego perceives situations from the standpoint of “I” and tries to grapple with feelings of hurt, grief and betrayal and fears of survival. This Ego can make you stubborn, unforgiving, punishing and sharp tongued. Saturn works on your third eye and literally aims at breaking your Ego, the identity that you hold, separating yourself from others. The more egoistic/stubborn/strong headed/perfectionist you are, the bigger will be Saturn’s blow to shatter your Ego. 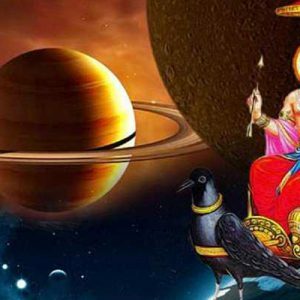 Saturn rides on a Crow which symbolises ancestors. He means to show you that the only moment is Now and past is gone. In the Now you are pure and free from any reference or perspective. In the Now you See the past and future on one place and take the right decisions. Trust.. Accept.. Surrender. Saturn phase is an opportunity from God for you to reflect on life from a higher perspective beyond the limitations of the “I”. Release the Ego that makes you compare with others, that makes you go into past and future and that makes you dependent on external people or situations. Pray to Hanuman and Katyayani Durga, chant Shani mantras, practice Ajna chakra meditation and wear Rudraksha 14 mukhi and 17 mukhi and Gemstone Blue Sapphire for immense help.